BERLIN (Reuters) - Bentley Motors' top designer has criticised Ford's new Lincoln Continental, fretting on social media about the car's similarities with one of its own models, Automotive News reported late on Tuesday. The Lincoln Continental luxury saloon, unveiled this week by Ford at the New York auto show, resembles the Bentley Flying Spur, Automotive News reported, citing comments by Bentley design chief Luc Donckerwolke that were picked up by online publication Car Design News. "Do you want us to send the product tooling?" Donckerwolke posted on Lincoln designer David Woodhouses' Facebook page, a comment that was subsequently deleted, Automotive News said. "This behaviour is not respectable. Building a copy like this is giving a bad name to the car design world," Donckerwolke was quoted as saying by Car Design News. A spokesman for Bentley, part of Volkswagen , sought to vindicate Donckerwolke's views. "Car design is always an emotive subject and one of the reasons so many of us love cars," the Crewe, England-based carmaker said in a statement published on Wednesday. "Our designers have strong views and are passionate about what they do, which drives them to create such extraordinary cars." Conversely, Lincoln spokesman Stephane Cesareo dismissed the Bentley designer's criticism. 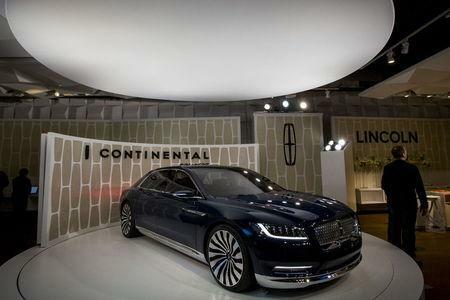 "The Lincoln Continental is clearly a Lincoln, we're very proud of it," Cesareo told Reuters. Ford is reviving the Lincoln Continental as its top-of-the-line luxury saloon as part of an effort to rebuild the brand's image in the United States and China. Volkswagen-owned Bentley has had a Continental in its lineup since 1984, while Ford retired the Continental name in 2002.